July 21st - July 26th, 2019 - 1 Space Available! 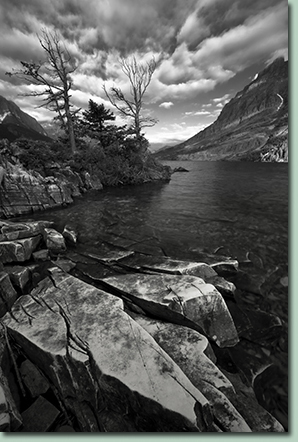 Biennial Workshop - Our next Glacier NP workshop will be held in the summer of 2021. 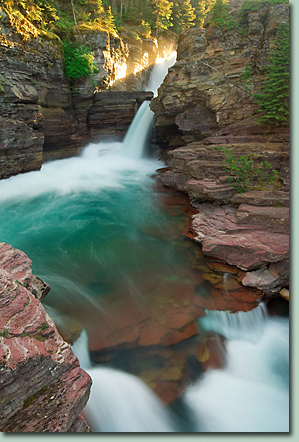 Join us as we photograph magnificent Glacier National Park. Our focus will be to shoot summer scenes against a back drop of dramatic mountains. 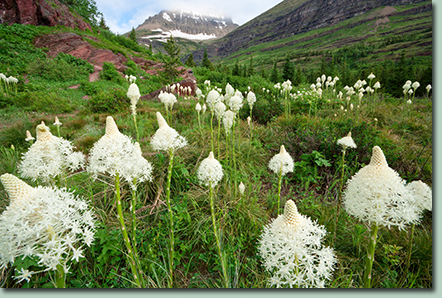 We will concentrate on the lakes and streams of the park and shoot wildflowers when they are present. While our primary purpose is to photograph the landscape of the park, we also intend to take advantage of wildlife opportunities when they happen. This workshop is geared for the intermediate to advanced photographer. However, beginners with a working knowledge of their camera can gain a lot of experience and instruction. Each participant is assisted at their level. We focus on helping participants create the most appealing compositions of each location we visit. We will also delve into discussions on equipment, exposure, metering, filters, processing and personal tips. This is a workshop environment, the instructor is present to aid in the field and teach his techniques for landscape photography. If you're an advanced photographer he will be happy to help or stay out of the way. Additionally, Because we stay at four different hotels during this workshop and relocate during the midday, this workshop has limited time available for processing assistance. Participants should check in with Andy on Sunday, (July 21st, 2019) outside, in front of the hotel office (Village Inn at Apgar), at 6:00 P.M. We will have an introduction and discussion then go to our first shooting location. First Lodging Location:Village Inn at Apgar, Glacier Nat'l Park (west side) Check-in - Sunday, July 21, 2019; Check-out - Monday, July 22, 2019. Andy was unable to secure a room in Apgar Village so his 1st lodging hotel is about 5 minutes away at the West Glacier Motel, West Glacier, MT. 1-844-868-7474. Many Glacier Hotel (instructor's hotel) or the nearby Swiftcurrent Motor Inn (east side): Check-in - Monday, July 22, 2019; Check-out - Wednesday, July 24, 2019. Town of East Glacier (east side): Check-in - Wednesday, July 24, 2019; Check-out - Thursday, July 25, 2019. Andy will stay at the Circle R Motel, 402 US Hwy 2 East, East Glacier 406-226-9331. For those who enjoy a more upscale hotel experience consider spending this night at the "Glacier Park Lodge" 406-892-2525, it's only 1/4 mile from the instructor's motel; Note: 3 floors, no elevator. Rising Sun Motor Inn (east side): Check-in - Thursday, July 25, 2019; Check-out - Saturday, July 27, 2019. Workshop ends after shooting sunset on Friday evening, July 26, 2019. Except for Wednesday evening, July 24th, 2019 (in East Glacier), all of the lodging mentioned above is located inside the park boundaries surrounded by spectacular scenery. The rustic rooms are clean and tidy, but do not have telephones, TVs or internet access. Lodging in the park is very popular and starts to fill one year in advance. Please arrange your lodging using the information above as soon as possible. Participants need to contact hotels and reserve their rooms upon registering for the workshop, if not earlier. Even if one has not registered for this workshop, but is strongly considering it, we recommend making hotel reservations as soon as possible (be mindful of the cancellation policy). We have several rooms reserved in most locations (not in East Glacier). If you're having difficulty securing reservations, please call us to see if we have a set of rooms (additional fee). For details, call 719-635-6268. Generally, participants can expect to be at a shooting location for the start of civil twilight and we'll stay at that location through sunrise. We will provide breakfast bars, and water for the early mornings. We will go to a late breakfast after the morning shoot. Typically, when not relocating, we will schedule a midday break allowing time to download, eat lunch, nap, provide Photoshop assistance... We do have dinner in a restaurant scheduled for each day and an evening shoot scheduled for each evening. Note: For most of the workshop we are on the east side of the park, dramatic sunsets will require clouds to liven the backlit mountains. This workshop does involve some trail hiking and elevation gain to arrive at certain shooting locations, while other shooting locations will be just beyond the parking lot. The trail hiking may deemed vigorous activity or light activity based upon your condition. Trail hiking surfaces and those beyond the parking lot are generally uneven, hiking boots are recommended. Our longer trails range between 2 and 3 miles each way. One doesn't have to be in tip-top shape, but a participant's enjoyment will be enhanced by good health and preparation. The elevation range of our shooting locations is 3,250 ft to 7,500 ft. Please consult with your doctor before attending our workshop or venturing to higher elevations. Proper hydration is a must at higher elevations. Without it one will lose strength, energy and may develop a severe headache. To avoid dehydration one MUST drink beyond their thirst; drink even though not thirsty. We will provide bottled water in the field, please drink it. Be prepared for possible temperature extremes and sudden changes in weather. Be aware that mornings can be very chilly. Often we will be out in darkness before sunrise and after sunset, please bring a flashlight. We plan to arrive at our morning location each day no later than 5:30 A.M. Sunset is approximately 9:20 P.M.
TRANSPORTATION: Most people flying to Montana for this workshop will find flying into Kalispell to be the best choice, others will find Spokane, WA (about 4.75 hours to West Glacier), Great Falls, Helena, Butte or Billings to be adequate. Please investigate the various options to arrive at one that best suits your needs. Do consider that the road through Glacier National Park (Going-To-The-Sun Road) is slow driving and may suffer rare closures due to natural events and construction. The southern route around the park usually remains open. Driving Conditions: Driving conditions will consist of mainly paved roads. When possible, during the workshop, we prefer that participants car pool with each other to help limit our impact and get to know each other. A standard rental car will be sufficient. Equipment Recommendations: Bring all camera equipment including the camera's manual. 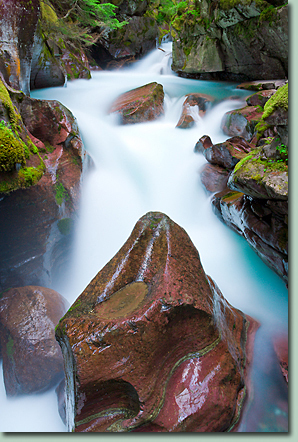 We recommend participants have a polarizing filter to use with many of the photographs on this workshop. Instead of using split-neutral density filters, Andy now combines images of various exposures in post processing. Andy will be happy to teach participants his field and post processing techniques for doing so (requires a cable release with some cameras). A lens range from 18mm to 200mm after the lens multiplication factor "LMF" (call if uncertain about LMF) is recommended for the landscape portion and a long lens 300mm or longer for shooting wildlife. However, we think that participants should bring their entire range of lenses. We recommend shooting with a sturdy outdoor tripod that can adjust from standing height (without cranking up a center post) to very close to the ground. This type of tripod does not have attachments from the legs to the center post; i.e. the legs can move independently. Please use a cable release or know how to work the camera's timer delay to avoid camera shake. Also bring hiking boots and a flashlight to the field portions of the workshop. We will be walking in pre dawn and post sunset darkness. Consider bringing a laptop with a recent version of Photoshop and calibrate the monitor. We do not guarantee the weather. Workshop fee does not include transportation, lodging or meals. We usually go out as a group to a restaurant for late breakfast and early dinner. Maximum number of participants is 10. We require an acknowledgment of risks be signed before going into the field. We will send the acknowledgment of risks upon registration, please return it at the start of the workshop. 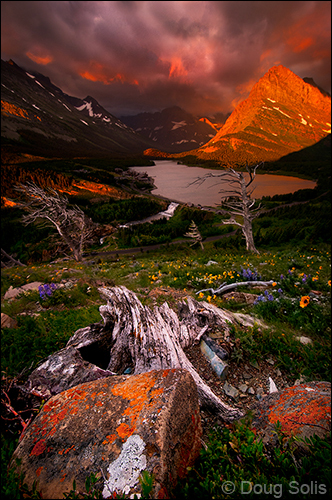 Glacier National Park is Grizzly country. In the event Rocky Mountain Reflections Photography, Inc. (RMRPI) cancels a workshop due to unforeseen circumstances such as inability to obtain permits, instructor injury, death... Then, RMRPI will refund fees collected by RMRPI for the affected workshop. In the event of a natural disaster, government closure or other happening of this nature that causes a workshop to be canceled, RMRPI may be unable to refund workshop fees. If this happens then funds collected by RMRPI will be applied as credit toward a future workshop of the participant's choosing. RMRPI will not be held responsible for other expenses (airline tickets, hotel deposits, rental car...) that may be associated with any canceled workshop. Pepper Spray - This is grizzly country participants may carry spray if it makes them feel comfortable (one may not be able to fly with this). 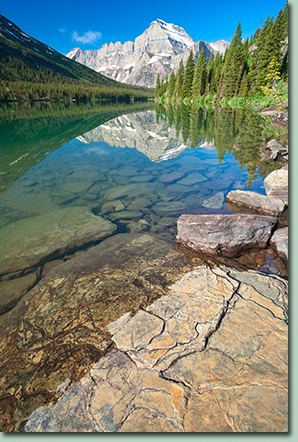 Rocky Mountain Reflections Photography, Inc. is authorized by the National Park Service, U.S. Department of the Interior, to conduct services in Glacier National Park.